New Hero7 Black promises "gimbal-like stabilization – without the gimbal"
Earlier today, US camera store B&H Photo leaked the details of the new range of GoPro cameras – the Hero7 Black, Hero7 Silver, and Hero7 White – and then GoPro itself leaked the prices via ads on Google. Now, the three action cams have been officially announced by Go Pro. Read our full GoPro Hero7 Black review here. The leaked press release, which was spotted by The Verge, detailed three new GoPro cameras. The Hero7 Black is the successor to the Hero6 Black, while GoPro has re-introduced the Silver name, which was last seen used for the GoPro Hero4 Silver. The Hero7 White is the new entry level camera which replaces the current £199 GoPro Hero. The new naming system makes the updated GoPro range a little less confusing, as previously the models available on GoPro's site were the Hero6 Black, Hero5 Black and Hero. The Hero7 Black is GoPro's new flagship action cam, which replaces the Hero6 Black. Like the Hero6 Black, the Hero7 Black offers 4K shooting at 60fps. It's also the only camera in the range to feature a removable battery. This camera also offers live streaming functionality, and Protune, which lets you manually adjust settings, such as white balance and ISO limit. The Hero7 Black also introduces "HyperSmooth Video Stabilization", which GoPro describes as "Gimbal-like stabilization–without the gimbal." If it is anything close to gimbal-like, that's likely to be a major appeal to buyers. 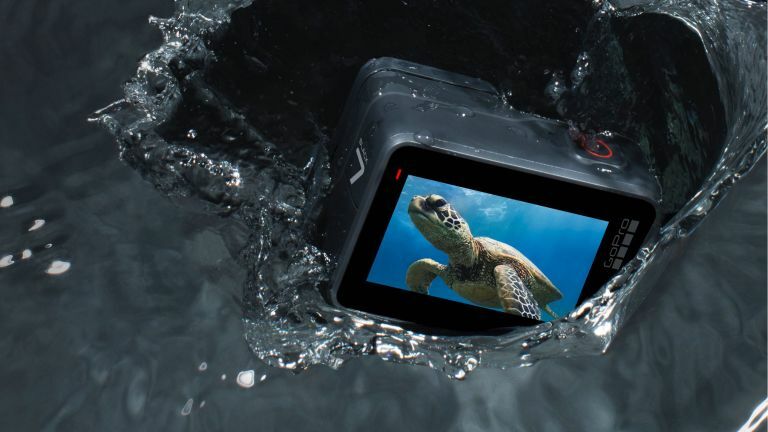 The GoPro Hero7 Silver replaces the Hero5 Black and, like the Hero5 Black, it features a 10 megapixel camera which can capture 4K footage at up to 30fps. The Hero7 White is GoPro's new entry level camera, replacing the (unnumbered) GoPro Hero. It can shoot HD (1080p60 video), which also happens to be the resolution that the older Hero shoots at. All three cameras feature a vertical capture feature for social media so that owners can shoot in portrait mode rather than landscape. All three models have a 2" touchscreen, are waterproof down to 33 feet, have GoPro Voice Control and can shoot time-lapse video. The new GoPro cameras are available to preorder on the GoPro website.